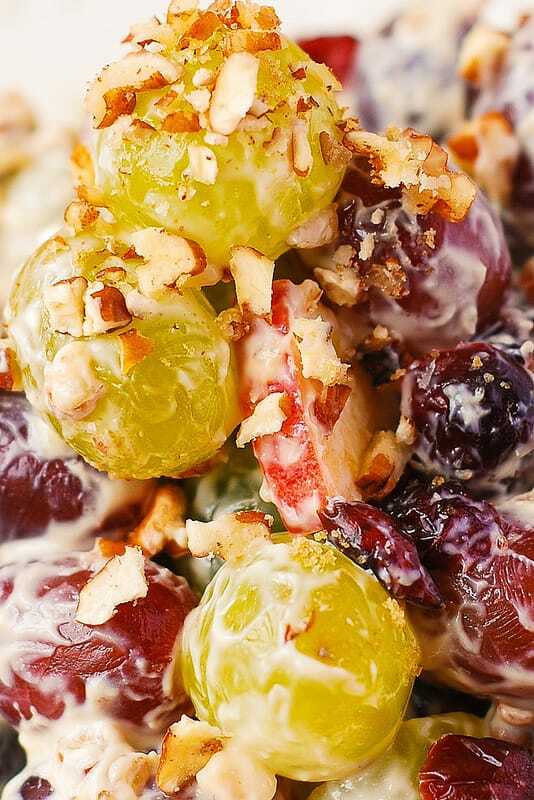 Creamy Vanilla Grape and Apple Salad with Cranberries and Pecans – a delicious side dish for the Fall season. 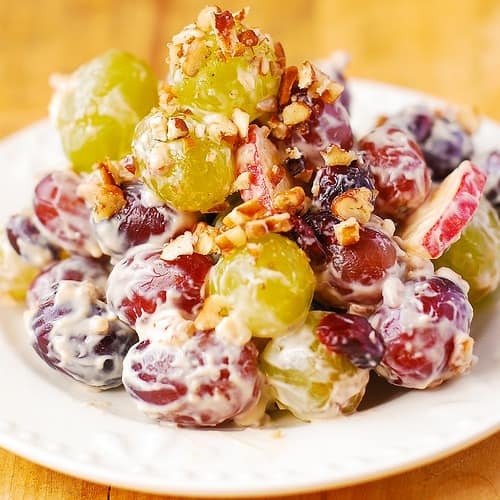 Creamy Vanilla Grape & Apple Salad with Cranberries and Pecans – this salad is so good, you will want it before dinner, as an appetizer, and after dinner, as a dessert! 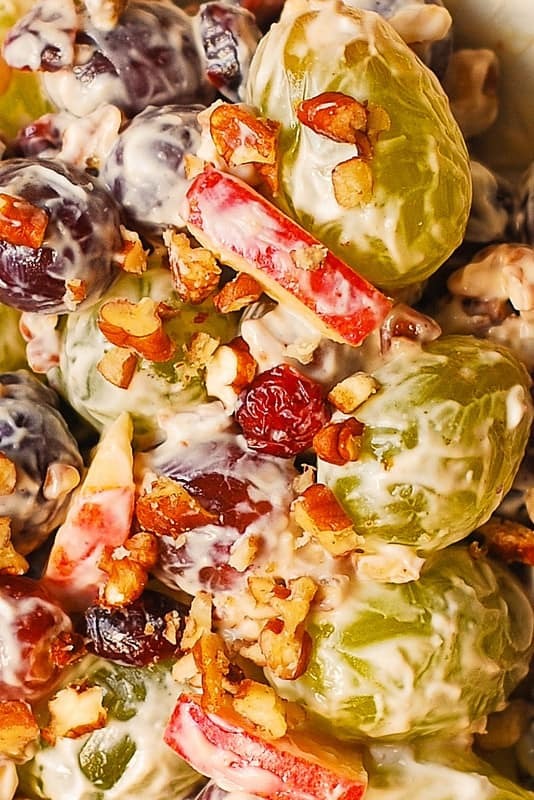 With the holidays coming up, this festive fruit salad will look great on the Thanksgiving and/or Christmas menu! 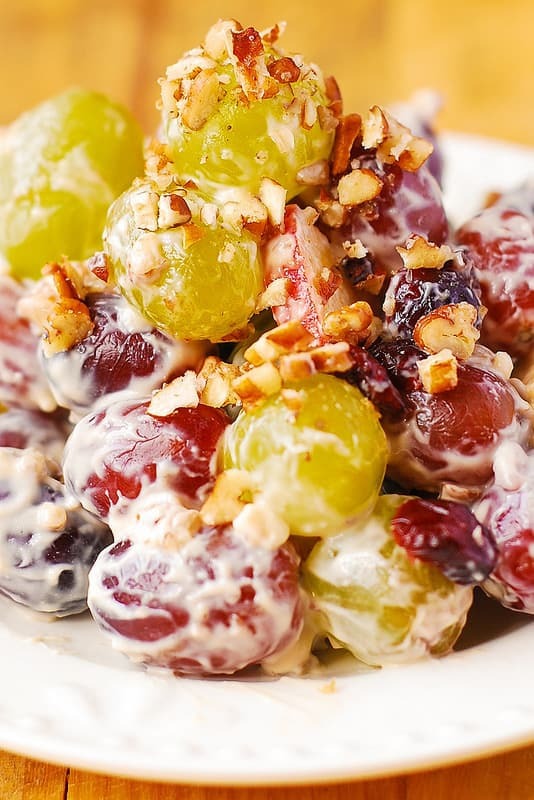 Creamy Vanilla Grape and Apple Salad with Cranberries and Pecans - a delicious side dish for the Fall season. Perfect for Thanksgiving, Christmas, New Year's Eve and other holidays! Gluten free recipe. In a medium bowl, combine softened cream cheese, sour cream, brown sugar, and vanilla extract. Using an electric mixer, blend the ingredients for about 2 minutes or until nice and smooth. 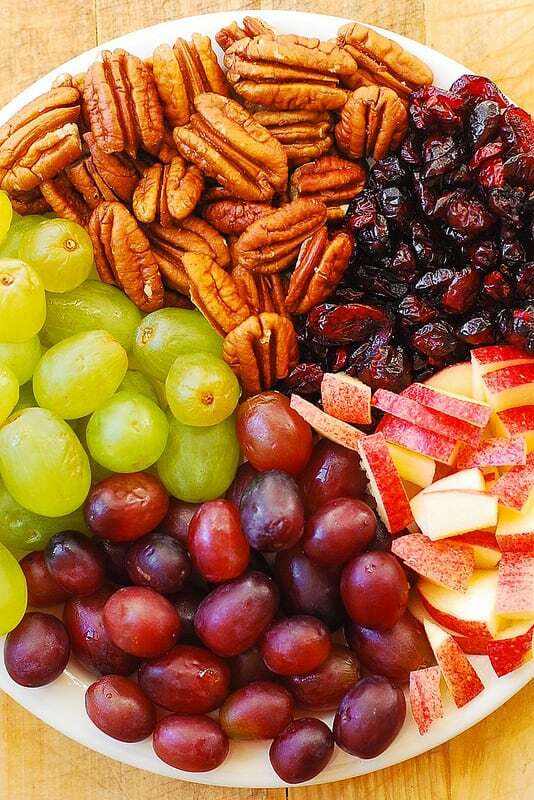 In a large bowl, combine the grapes, diced apples, chopped pecans, and cranberries. Add the dressing and toss to coat. Refrigerate until ready to serve. When you are ready to serve, top with extra chopped pecans and a small amount of brown sugar (if desired). Looks yummy. I love to add marshmallows to mine. Never tried vanilla in the dressing but sounds like a great add. Adding marshmallows sounds delicious! Enjoy the recipe! We make this a bit differently. We use two kinds of grapes. I love the idea of adding apples. We also use two crushed up butterfinger bars along with the chopped pecans and brown sugar mixture. Can this be made the day before? Thank you! Yes, you can make this recipe a day in advance. Keep it refrigerated in an air-tight container. Does the dressing keep the apples from turning brown? Can i freeze this dish for later? I wouldn’t freeze this, because that will affect the texture of the salad dressing. Is it ok to cut the grapes in half? The grapes I have are so large. Yes, cut them in half if they are large.